Damn, I’m going to miss Jens Voigt when he retires – rumored to be this year. 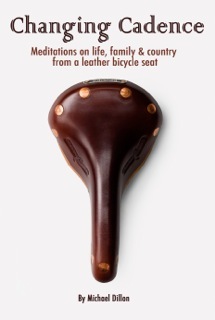 He has always brought an element of joy and levity to the world of cycling. That’s what I was thinking as I watched the Tour de California last week. It was a great event featuring Bozeman’s own Tejay van Garderen who finished atop the podium by a little less than two minutes. You race more than 150 other cyclists over eight consecutive days. You race a distance of more than 750 miles. You race through all variety of terrain and conditions. You compete as part of a team and in individual time trials. And, you win by less than two minutes. There just is no other athletic endeavor like professional cycling. But it was Jens Voigt who I found so inspiring to watch. At 41 years of age, Voigt is one of the oldest and more accomplished riders in professional cycling with an impressive list of past wins, including in the Tour de France and Giro d’Italia. Yet when the television cameras first came to rest on Voigt during the second day of racing, he was serving as a domestique (French for “servant”) for his fellow riders (many of whom were in their infancy when Voigt won his first professional race). As the heat increased to 110 degrees during this 125 mile stage, you could see Voigt drifting to the back of the peloton and pedaling next to the team car where he would load water bottles in the pockets and down the back of his riding jersey. Then he would cycle back through the crowd of riders handing out fresh fluids to his teammates with a smile and words of encouragement in his uniquely energetic style of speech. For those not familiar with professional cycling, this is the equivalent of having Kobe Bryant grab a towel and get down on his knees in the middle of the basketball court to wipe up the perspiration so his fellow players have traction. On the fifth day of racing, Voigt showed that he was not yet ready to “go gentle into that good night”. 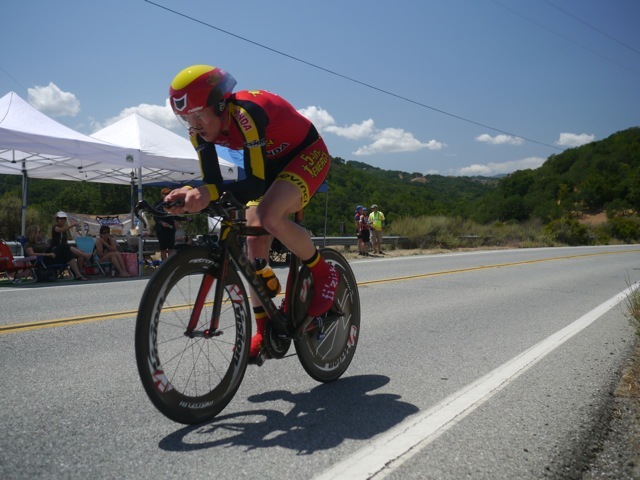 With 20 miles remaining in the day’s 115 mile race to Avila Beach, Voigt sensed that the wind was shifting from the front to the side. Quietly, he signaled to a couple of teammates and they worked their way to the head of the other riders to try to take advantage of the change in conditions. Within a few minutes, a dozen other riders had joined Voigt and they were able to mount an attack and break away from the peloton by more than a minute. This was great news for Voigt until he looked around and saw that the riders keeping him company in the break included three of the strongest sprinters in the world – Peter Sagan, Thor Hushovd, Tyler Farrar. For Voigt this meant he had rely on guile instead of speed to win. On a slight climb a few miles from the finish, Voigt surprised the other riders with a sudden acceleration. And for the remainder of the stage, he pedaled like a man racing against age, (presumably yelling “shut up legs!” – the phrase he is best known for) until he crossed the finish line in first, 10 seconds ahead of the nearest rider. Two days later Bay Area cycling fans were able to enjoy Voigt and the other riders in person as they competed in a 20 mile individual time trial in South San Jose, which ended atop the infamous “Metcalf Mauler”, a 2 mile climb of more than 1,000 feet. The riders passing by that day were a blur of high speed streamlining as they attempted to maintain perfect aerodynamic form and maximum speed while riding bicycles that appeared to be out of a science fiction movie. Voigt? He used a different technique making exaggerated zigzags in celebration as he crossed the finish line and even slapping palms with fans as he pedaled up Metcalf. Professional cycling is a sport in which many of the competitors act as if their occupation involves coal mining, sanitation work or trying to select makeup for Lady Gaga. Not Voigt. He always rides as if he understands that he is getting paid for doing the same thing he did as a young boy – riding a bicycle. I think of this quote from Jonathan Swift frequently when I travel. I don’t know how it started, but about a decade ago, business colleagues began to assume I was the original “Mikey” and that I would eat anything. I would fly overseas and the local team would insist on taking me out for a meal that always pushed the limits of my American culinary cultural boundaries. I never determined whether it was intended as some sort of challenge or a sign of respect. All I knew is that wherever I visited, a gustatory trial awaited. The first time was during a visit to Beijing. The local team took me out to dinner at what they described as a “ very special” restaurant. We sat down and, not understanding a word of Mandarin, I left it to my host to order. A few minutes later, the first course arrived. It consisted of some kind of spicy stew with assorted vegetables and, in the middle of the bowl, a fairly large bullfrog. That’s correct. A bullfrog. Not wanting to offend, I dipped into the stew with trepidation and eyed the bullfrog staring back at me. As I attempted to carry on a conversation with my coworkers, my mind vacillated between (a) “how do I eat this thing?” and (b) “is there any scenario under which hurling on the table is not a career limiting move?” The combination of intense jet lag, a foreign environment and the sizable amphibian made me begin to feel lightheaded and nauseous. Luckily, it was at that moment that the waiter reappeared and said something in sharp Mandarin that brought me out of my haze. With a deft movement he plucked the bullfrog from the soup and onto a nearby chopping block where he quickly carved it and scraped the meat back into my bowl before doing the same for others. Since that time, I’ve encountered this same type of “hospitality” in visits to other places. It has resulted in me eating: spicy dried crickets and deep fried worms (both surprisingly tasty snacks) in Mexico City; snake and sea horse soup in Beijing; phaal curry (so spicy it seared my taste buds for weeks) in Bangalore; pig knuckles in Munich; jellyfish in Tokyo (never again); pigeon in Chartres; kimchee in Korea (in my opinion, no food should be fermented unless it comes in a beer bottle); and a kangaroo steak in Sydney. Along the way, I’ve learned to embrace the cuisine on my travels as a part of the cultural experience, no matter how alien to what I normally eat. On some trips, I’ve actually acquired an affinity for a food I have never previously sampled. I’m planning on visiting the Adobe team in Singapore sometime in the next few months. I expect that durian will be on the menu. 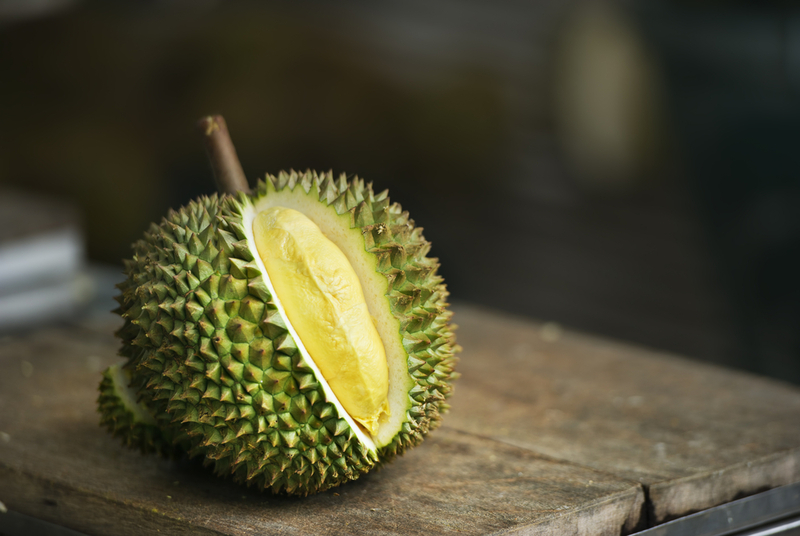 Durian is a sweet tasting South Asian fruit known for its spiky appearance and, especially, its strong odor. Just how bad does it smell? This should give you an idea. I’m going to start preparing for the experience by emptying my son’s gym bag and picking up after my dog more frequently. But, to my colleagues in Singapore, I look forward to the challenge. 1. It was a month in which Boston citizens showed great courage. 5. Did I mention that I don’t trust ‘em?